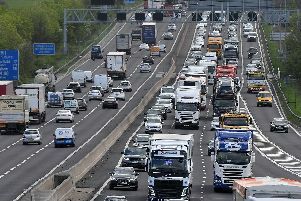 Police who stopped a vehicle with suspected false number plates discovered that the jobless motorist was driving on the M1 motorway without a full licence and insurance. Chesterfield magistrates’ court heard on November 13 how Jake Mawson, 19, of no fixed abode, was spotted and stopped by police on the northbound carriageway of the M1 at Tibshelf. Mawson was the sole occupant of the vehicle, according to Mrs Allsop, and he only had a provisional licence and he had no insurance. The defendant pleaded guilty to driving otherwise than in accordance with a licence and to driving without insurance. Maswon told the court he is not on benefits and has no regular income and just gets by with help from friends and does some labouring work in construction. Magistrates fined Mawson £120 and ordered him to pay £85 costs and a £30 victim surcharge. Mawson was also banned from driving for six months.